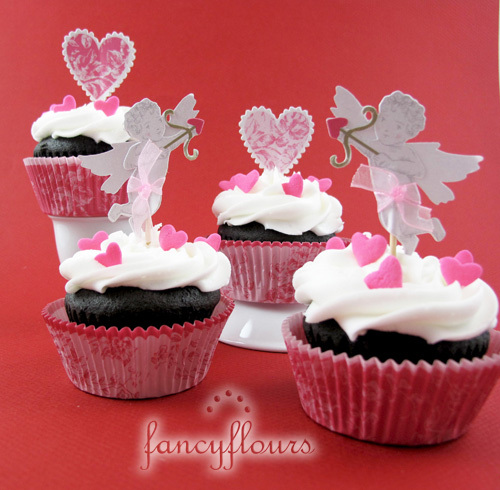 This entry was posted in Cupcake Recipes & Ideas, Valentine's Day Baking and tagged cupcakes, cupid, fancyflours, heart, valentine by Fancy Flours. Bookmark the permalink. I love Fancy Flowers. I was just going to place an order, all I needed was a 2 x 5 square cookie cutter for the cherub edible paper cookies but shipping is $8! the cutter is only $2. If the shipping weren’t so expensive I’d order more often. These look yummy. The hearts are similar to a Valentines Day cookie I’m making now (a very delicate toile design on top with wafer paper purchased from Fancy Flours).